Welcome to the initial playtest page for Dune Wars! Based on the seminal works of Frank Herbert, the Dune novels are one of science fictions most revered and noted accomplishments. In a world of imagination unlike any other, yet strangely paralleling current events, the society envisioned by Herbert is a complex tapestry of politics, intrigue, betrayal and prophecy. This examination focuses on the potential space battles that could have occurred in the tightly controlled Imperium of the Million Worlds. 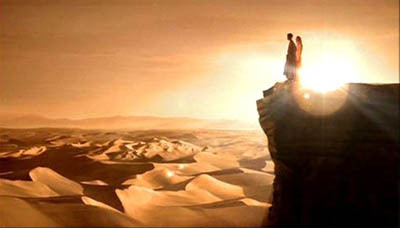 Specifically covering the end of the tenth millennium, the time frame of the rise of Leto Atreides, the Paddishah Emperor Shaddam the IVth, and the Baron Harkonnen covered in Brian Herbert and Kevin J. Andersen's prequel works, to the early years of the eleventh millennium, focusing on the betrayal of House Atreides, the fall of House Corrino, and the eventual rise of the Empire of Paul Maud'dib and the Great Jihad spearheaded by the Fremen that overtook the galaxy. These later events are covered in Frank Herbert's original work Dune, Dune Messiah, and Children of Dune. While space battles were relatively rare in the original books the capacity for conflict there is well established. Dune Wars primarily investigates the Dune ships of the Houses of the Landsraad, the Sardaukar of the Imperial House Corrino, and the great mental training orders of the Bene Gesserit and Bene Tleixalu in terms of their potential for campaign play. Of particular interest are the unique technologies and outlook of this society. The Imperium is a tight knit political order, and its culture is derived from two fundamental principles. The first is the great Proscripture, 'You shall make no machine in the form of the human mind.' This arose from the Butlerian Jihad, humanity's greatest test when their thinking machines arose against us and tried to destroy their masters. Instead of the computers and sentient AIs depicted in so many science fiction stories, the societies of Dune rely on the perfection of the human form in order to replace the specialties of the artifacts destroyed in the wars between man and machine. This led to the rise of what we would consider the superhuman capabilities of the human mind, the computational experts of the Order of Mentats; and to the great vision of those who understand the inner workings of space-time, the prescient Navigators of the Spacing Guild. Other great works of human accomplishment spun from the great mental/physical training orders in the form of the genetic manipulation of the Bene Tleixalu, culminating in the shapeshifting Face Dancers, and the control of the feminine mystique and subtle influence of the Bene Gesserit sisterhood, including the powerful discipline the Voice which compels obedience from those that hear it and the genetic memory of the Reverend Mothers that allows them the thoughts and experiences of all the females of their bloodline. For this reason Dune Wars is about more than just the military machines of the Imperium. Indeed, Dune is largely about the possibilities of human potential, and playing without the elite character rules in the Rules Compendium is not recommended. There are a great many new elite characters for this setting, and they add greatly to the nuance and ambience of the game. The second great influence is the geriatric drug known as the spice melange. The foremost example of the organic technology of the Million Worlds, the Spice is a true miracle, even just in its most basic form as an extender of life to those who can afford it. But even more importantly it controls interstellar travel, opening the minds of the Guild Navigators so they can anticipate that dangers of travel through the Imperium. This enables their monopoly on space travel, as only the Spacing Guild has been able to modify human potential through the use of vast quantities of Spice at the level necessary for the prescience required to move the enormous Guild Heighliners through the folds of space-time. The spice is only found on the desert world Arrakis, known by its native inhabitants as Dune, as only there the source of the spice, the great Sandworms of Dune, can exist. For those that wish to take the warriors of the Dune universe into battle, they find an interesting balance of strengths and weaknesses. The warships of the Million Worlds are limited by political factors. The Great Proscriptures banning thinking machines limits their sensor capabilities severely, and almost all Dune ships have the flaw Antiquated Sensors with which to contend. For a society that has been space faring for twenty thousand years the Guild Peace has kept the development of weaponry to a lower level than would be anticipated, as the great Houses mostly employ matter and ballistic weapons even at this stage of their development. And their most feared weapon, the Lasgun, a laser weapon superior to most found in other universes, has a powerful reaction to their most effective defense, the Holtzman Shield. A Lasgun fired at a Shield causes a reaction most similar to a nuclear fission explosion, often destroying both the firing and defending vessel. Still, the Dune ships are singularly unique, and have many positive characteristics as well. 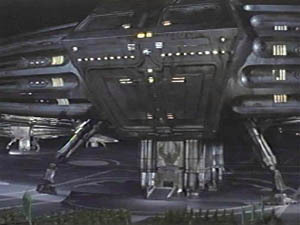 Their matter weapons are very advanced and more versatile than most, from the multi-spinning chambers of the Vulcan Railgun to the defensive capability of the Rail Interceptor Array. The Holtzman shield is a powerful defense, and often utilized in what otherwise would be considered attrition units by the Houses of the Imperium. Dune fighters and light combat vessels often have powerful defenses as these hulls are considered worth risking to the vagaries of the Holtzman effect. Their elite characters have many abilities, and combined with the mysteries of spice often exceed those of normal humans. They are masters of boarding combat, with the infiltration abilities of Face Dancers, the brutal discipline of the Sardaukar, and the tempered fury of the Feydakin death commandoes of the Fremen being virtually unmatched. And finally the political machinations of the Imperium can be as deadly as any Lasgun attack. Welcome to Dune Wars! Protect the Heighliner, send your troops to take the fight to the enemy directly, and have your mentat masters of assassins calculate the best advantages for betrayal and infiltration. And always remember the cardinal rule of Dune: the Spice Must Flow!